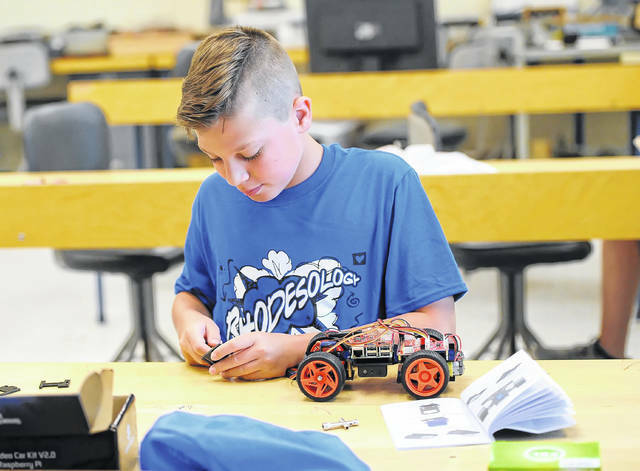 Gannon Casebolt, 12, creates a project at Rhodesology Summer Camps on Tuesday. The camp is offered annually by Rhodes State College which allows attendees to experience skilled concepts in engineering, sports and fitness, visual and written arts, aerodynamics, propulsion and resistance while building and launching a rocket. LIMA — Area students in 6th to 9th grades have the opportunity to explore a wide range of interests in computer programming, medicine, physical fitness and even law enforcement during Rhodes State College’s annual Rhodesology camps this week. “With the age group were having — 6th, 7th, 8th and 9th-graders — what we’re trying to do to them is get them excited about some of these skills and show them these skills can be fun,” said Paul Burkholder, assistant professor and chair for information and emerging technology at Rhodes State and one of the teachers of the robotics Rhodesology Camp. In the robotics camp, the children use a kit to build their own robot with a web cam attached to it and then program it. This teaches them mechanical, engineering and programming skills while making the experience fun, he said. During the Minecraft Mod Camp, children learn about the connection between computer programming and actual game play, said Quinn Wygal, a Rhodes State College graduate in network security and the teacher of the class. The children at the camp learn how to alter the Minecraft while seeing how computer programming causes the alterations. Burkholder said the goal isn’t just to make the camps fun for the children but also to possibly ignite a spark of curiosity in the children, inspiring them to pursue a career in one of the fields the camps cover. Rhodesology used to take place over the first part of the week — Monday, Tuesday and ending Wednesday — but it has been expanded to include Thursday and Friday this year. Wednesday is the final day for the first part of Rhodesology, with the second part beginning Thursday morning. The camps offered Thursday and Friday include Drone Camp, Creation Station, Rocket Propulsion, Photograph and Video Editing and Write Track. Registration is still open for the Thursday and Friday camps, which cost $60. To register call 419-995-8334.